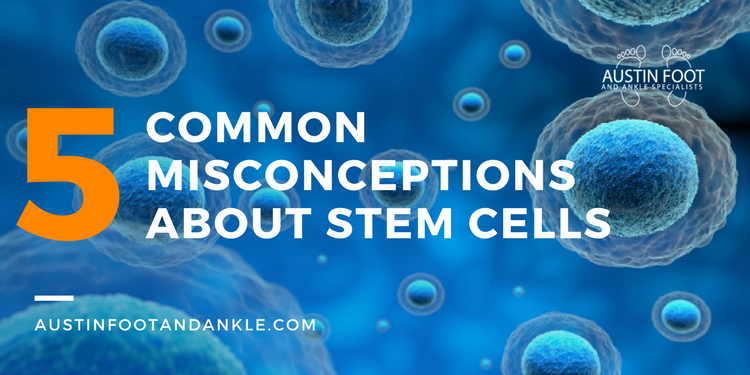 Stem cells are a somewhat controversial topic within in the general population – something that can be attributed to common misconceptions. A little understanding of the truth about stem cells—and their potential uses within the medical community—can serve to resolve the controversy. Myth #1 – "Stem Cell Research is Illegal or Unregulated"
Stem cell research is legal, as long as it is done in accordance with regulations and guidelines established by both federal and state legislature. On the federal level, stem cell research is regulated by the National Institutes of Health and U.S. Food and Drug Administration (FDA). Whereas the FDA does not regulate the practice of medicine, it is the governmental agency responsible for ensuring the safety and efficacy of drug products. Along with federal oversight, individual states have the right to further regulate both the research and use of stem cells for medical purposes. Whereas stem cell research—when performed in accordance with established regulations—is legal, certain stem cell therapy technologies are still under review by the FDA. In the event you hear about approval overseas, it is worth noting that review from the European Union’s regulatory agencies generally takes about 5 years less than it does for our federal agency. That said, there are certain stem cell therapies currently approved and used in the United States. For example, adult stem cell therapy is used to treat conditions like leukemia and other illnesses. A key distinction to make is the fact “adult” stem cells are different than “harvested” ones. These particular cells exist in our bodies (throughout bone marrow, blood, fat, organs, skin, teeth, and other places). Even though some adult stem cell therapies are used, there is still lots of highly-regulated research being conducted on the uses and benefits of this kind of treatment. Myth #2 – "All Stem Cells are Harvested from Embryos"
This misconception is a fairly prominent one when we look at the controversy over stem cell therapy. Contrary to popular belief, embryos and fetuses are not actually the source for most stem cells. Rather, researchers are more likely to obtain stem cells from discarded biological material from the birthing process – such as umbilical cord blood and placentas. This is obviously painless and less controversial, but there’s another benefit in the fact that there are maintenance processes available that allow companies to store these stem cells indefinitely (for research or future use). Since we are discussing the source of stem cells, it is worth mentioning that a less-common misconception is that bone marrow is the best (non-embryonic) source. This is also not true. Bone marrow may be a source—one that has been studied for many years and used for many decades to treat certain kinds of cancer—but it is certainly not the only. Perhaps this misconception comes from the simple fact that bone marrow stem cells are already used in treatment, and a great deal of resources have been provided to understand their potential. In reality, the category of stem cells found in bone marrow (mesenchymal stem cells) are actually found in fat tissue (adipose) at almost 2000 times the frequency they are in bone marrow. One final note on this matter is a 2007 breakthrough from Shinya Yamanaka of Kyoto University in Japan. Yamanaka discovered a process in which adult skin cells could be converted back into an embryonic state. In doing so, the cells have shown to regain the ability to branch into any kind of human cell (like those found in organs and the spinal cord). This particular research is still in fairly infantile stages, however, and it will likely be some time before progress is made into approved practices. Myth #3 – "The Catholic Church Opposes Stem Cell Research"
This is an important misconception to dispel following the previous one regarding the sources used to obtain stem cells. If stem cells were harvested as the result of human embryo destruction (abortion), the Catholic Church would be quite opposed to the practice. Since that is core issue for the Church and—as we previously noted—the majority of stem cells come from different sources, this is not an issue. In fact, former Pope Benedict XVI publicly spoke out in favor of stem cell research, as long as the cells come from ethical sources like adult tissue or discarded biological tissues from births. Myth #4 – "Stem Cells are a Magical Cure for Everything and Those Cures are Right Around the Corner"
Stem cells are not a “magic” cure, nor will they ever be (in all likelihood). That said, they will almost assuredly prove to be a useful treatment option for many different injuries and illnesses. The misconception that stem cells can cure anything likely originates from current use in transplants and people hearing about them in conjunction with regenerative medicine. While research and clinical trials do suggest regenerative properties, there is more to the story. Some people may think a doctor can (or will be able to in the future) simply inject stem cells near an affected area and they will make a beeline to the right location and go straight to work. Realistically, it just doesn’t work that way, and probably never will. It might help to think about the hype surrounding gene therapy almost two decades earlier. When news started breaking about research being done in this area, there was a misconception it would be able to cure all types of diseases. All this time later, it is still a highly experimental field. When stem cells are used, they have to be properly directed to the intended location. Once there, they may assist in healing damaged tissue, but are incapable of completely curing the problem. This is all a major reason the regulated, applicable use of this kind of technology is still in its initial stages. More research studies, clinical trials, and fine-tuning is in order before we come close to understanding the realistic potential of stem cell therapy. That can take a long time, but it’s really for the best – the time will be used to make sure we have a safe, viable medical option to address certain conditions. Myth #5 – "The Human Body Will Reject Stem Cells"
We have all heard about failed organ transplants and know the body will sometimes reject organs even if they are essential to continue living. Due to this, there is a misconception that stem cells can also be rejected. Now, future research and clinical trials may potentially point to a different direction, but current evidence available—based on adult stem cells—shows that a body will not necessarily reject certain stem cell therapies. At this time, the understanding is that stem cells derived from a patient’s body and placed into another area are not rejected. Further, this particular approach has yet to demonstrate any kind of safety issues. Whether or not the same case will be demonstrated in further studies using harvested stem cells, it is accurate to say there are stem cells the body will not reject. Sure, they may come from within the same body, but they are cells that can be used in different areas to achieve objectives – and that actually has some exciting implications for the future of this technology.